Chinese ambassador to Chile Xu Bu slammed US Secretary of State Mike Pompeo's accusations against China during his visit to Latin America, saying Pompeo is "losing his mind" and is a "hypocrite." In an interview with Chile's La Tercera daily on Saturday, Xu denied that China's investment was "corrosive," Chinese companies were engaged in espionage and that China was not a reliable partner, all allegations made by Pompeo during his visit to Santiago on Friday. While calling the accusations groundless and absurd, Xu said that "Mr. Pompeo has lost his mind and he has gone too far," according to the Chinese Embassy in Chile which published Xu's interview in Chinese. Chinese Foreign Ministry Spokesperson Lu Kang also refuted Pompeo's accusations at Monday's routine press conference. Lu said that Pompeo had slandered China and China-Latin America relations and made irresponsible and groundless accusations, which China strongly opposed. It is worth pointing out that some US politicians have slandered China all over the world for quite a while and tried to alienate China from the world, according to Lu. "However, a lie is a lie even if said a thousand times. Mr. Pompeo can stop now," Lu said at the press conference. Xu said that Pompeo is a hypocrite because the US has not made any substantial contribution to the economic development of Latin American countries, but he disparaged China's economic and trade cooperation with Latin America and Chinese investment in the region. The economic and trade cooperation between China and Chile has brought tangible benefits to the development of the Chilean economy, Xu noted. Last year, China invested more than $6 billion in Chile, and China-Chile trade volume exceeded $42.8 billion, far exceeding the $24 billion of Chile-US trade volume, according to Xu. The benefits of China-Chile economic and trade cooperation are mutual, he said. 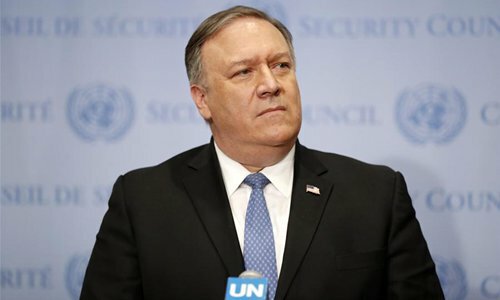 While visiting Santiago, Chile on Friday, Pompeo warned that "when China does business in places like Latin America, it often injects corrosive capital into the economic bloodstream, giving life to corruption, and eroding good governance," the Wall Street Journal reported on Friday. Xu said that Pompeo's accusation that Chinese technology giant Huawei is controlled by the Chinese government, is a malicious lie. The accusation is an attempt to strangle the legitimate operations of Chinese high-tech companies under the guise of security. "Actually, it is the US that eavesdrops on other countries using high tech companies," he said. "The US has been pressuring other countries to ban Huawei products for a long time, but it has failed in Europe and New Zealand. I believe that the Chilean government will make a wise decision because Huawei's 5G technology is the most advanced in the world," Xu said, adding that "what we see now is that Chile welcomes Huawei to expand investment in Chile." Huawei has been operating in Chile for many years, and helped construct the Southern Optical Fiber Project, which won recognition of local partners. The Chilean president will pay a state visit to China on April 24 and attend the Second Belt and Road Forum for International Cooperation. Several senior officials will accompany the president, showing that Chile attaches high importance to the deepened development of relations with China. During President Sebastian Pinera's China visit, the two sides are expected to sign a series of agreements to promote bilateral cooperation in various fields, according to Xu. Xu also made remarks on relations between the US and Latin American countries in response to Pompeo's claim that the US is a reliable friend to Latin America. He said Pompeo underestimated the memory of Latin Americans. Historically, the US viewed Latin America as its "backyard," and has conducted military interference or sanctions against those countries. Xu listed several examples including the ruthless US blockade of Cuba that has lasted more than half a century. Regarding the Venezuelan issue, Xu said that solving the country's problems and deciding whether the Maduro administration is legitimate is up to the people of Venezuela. "If the US really cares about democracy and human rights in Latin America, it should immediately stop sanctions against other countries, and adopt measures to promote economic development of the region instead of making empty promises," Xu said. In a signed article by Xu in Chile's El Mercurio that was also published on Saturday, Xu said Pompeo is "completely wrong" in making those accusations. "Pompeo's body has entered the 21st century, but his mind is still in the 20th century, which is fixated on hegemony and the cold war mentality," Xu said. He said that Pompeo should clearly realize that relations between countries will only last long if they are based on mutual respect and cooperation.